SIMPSON Cleaning ALH4240 Review: Should You Buy Yay or Nay? The Simpson Cleaning ALH4240 machine is a powerful commercial cleaner, but one that lacks storage space built into the chassis. ​There aren’t a lot in the way of included accessories for the price tag, but you do get a very high CU rating. We look at the pros and cons of this machine below. High-quality materials have been used, but greater protection of internal components would be better. The warranty varies between components, and isn’t particularly lengthy for any of them. Quick-connect models and an uncomplicated design keep this pressure washer simple to use. This model comes with a premium price tag, though it lacks some of the durability of competing models. The SIMPSON Cleaning ALH4240 could technically be considered a premium pressure washer, given its premium price tag. However, at first glance it isn’t the most heavy-duty washer by appearance. The minimal frame and small footprint almost suggest a weaker model, though this isn’t the case at all; with a CU rating of 16,800, this is in fact one of the most powerful cleaners you can get. 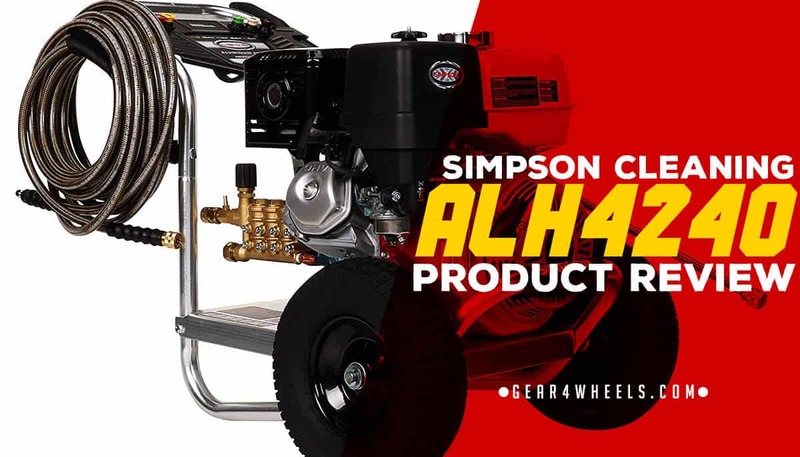 The manufacturer of the Simpson ALH4240 touts this pressure washer as being designed specifically to meet the demands of a cleaning professional in a commercial environment. Contractors specializing in tasks such as deck cleaning, graffiti removal, vehicle cleaning and other tasks can benefit from an extremely powerful clean. The materials and components used to bring this product together are tried and tested for the commercial arena, offering resistance to damp and weather in adverse environments, whilst withstanding knocks, bumps and scrapes. The warranty also covers all components at varying length, providing peace of mind even if the worst should happen, though it could benefit from being longer. Included within this package are 5 quick-connect nozzles of varying angle, including 0°, 15°, 25°, 40° and a soap-compatible detergent nozzle. The included 50-foot hose is steel-braided, which prevents kinking and abrasions. Additionally, there is an on-board accessory storage system that helps to keep all your accessories and attachments in order. Unfortunately, there is no hose reel included in the box with this pressure washer. Given the lack of storage space on the machine’s minimalistic frame, this is something that we could really use. The Simpson ALH4240 comes equipped with a Honda GX390 engine, which has a built-in oil alert, warning you when you need to refill your engine oil. ​There's also a CAT Industrial Triplex Plunger Pump that promises dependable performance. We also love the Dial-N-Wash spray gun, which lets you adjust your spray pressure between 1,000 PSI and the full 4,200 PSI. A downstream detergent injection system allows cleaning products to be directly introduced into the flow of water, bringing greater cleaning efficiency to those tougher tasks and stubborn stains. Safety-conscious users will be happy to know that the pressure washer includes a safety lock-out, which conveniently prevents the gun from being accidentally discharged when not in use. There are many commercial, premium-range pressure washers on the market and price tags tend to vary more greatly within premium models than in other tiers. This model is at the cheaper end of that range, but still pricey for the design, which isn’t quite up to the same standard of durability as many competing models. However, it’s very powerful and offers more than just basic functionality, without being too difficult to understand and use. It’s also lightweight, making it much easier to move than some other, larger units.